For a solid Cab in the $20 – $25 range this one definitely fits the bill. 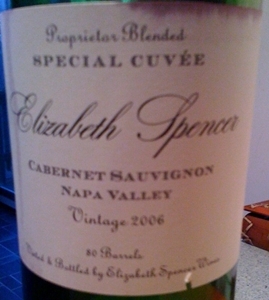 Classic Cab flavors and a big full body with well structured but not overpowering tannins. 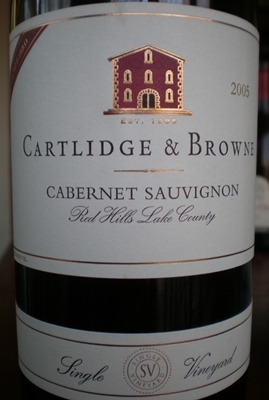 We had the 2005 Cartlidge & Browne Cabernet with a rich “green and white” lasagna and it paired very well. Christmas day was spent at my parent’s house, and was a fun day of present opening and over eating. Even though my parents bought plenty of wine, and told me not to bring any, you know I couldn’t show up empty handed. So we took over some Pedroncelli Chardonnay and a bottle of the 2001 Grgich Hills Cab that has been in the cellar since our first trip to Napa 3 years ago that we had really been wanting to drink. We stuck to reds all day so the Chardonnay didn’t get opened, but we did open the Grgich for dinner. Grgich was the first winery that we visited our first day in Napa, and we were thrilled with the experience and psyched about the wines that we tasted and thus bought a few while we were there. My prior enjoyment with the Grgich winery and all of their wines, my appreciation for all that Mike Grigich has done and a price tag of $55 could have helped in my disappointment (although it small) in this wine. I didn’t take any notes for the wine, so this isn’t going to be as formal a review as I have done in the past. The Grgich cab was unfortunately pretty one dimensional, with a lot of dark fruit aromas and flavors on the nose and palette. It did have a really nice weight in the mouth, and was really silky smooth but too smooth. The tannins were non existent and thus the wine didn’t have much of a back bone. I think the frame of reference of a 55 dollar price tag contributed the most to my disappointment, as if this was a $15 Cab I don’t think I would have critiqued it so hard. But also, I really have had a lot of good wines from Grgich in the past so this won’t deter me from buying more $55 wines from them in the future. If you are in Napa or planning a visit, I recommend you take a trip to the Grigich tasting room and sample what they have to offer, I don’t think you will be disappointed. Make sure to keep a look out for Mike Grgich himself, sporting his black beret, he would be happy to chat with you as he was with Megan and I.